Long before there was an Arduino module, I had created the Ultimate OEM module based on the OEM Basic Stamp module from Parallax (OEM Basic Stamp was originally designed by Bruce Reynolds of Rentron.com). My Ultimate OEM used a bootloader just like Arduino and also used a serial connection just like the original Arduino. The Arduino then switched to a USB interface but back when the Ultimate OEM was around, USB wasn't very popular. The module could use either the Basic Atom interpreter chip or a 28 pin PIC programmed with a bootloader just by changing a couple shorting block jumpers. This allowed you to use it with Basic Atom software or use the bootloader PIC version with any Basic, C or Assembly language program. PICBASIC Pro was the most popular. 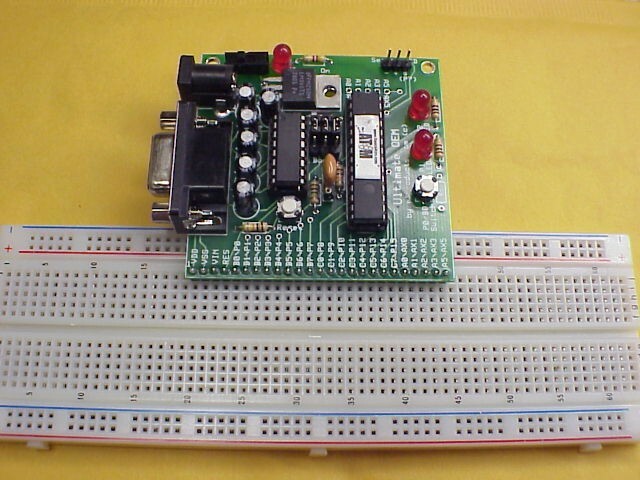 Through my experience with serial bootloaders I decided that a direct programming method was a better choice and the PICkit 2 was a "just released" low cost PIC programming option back then. So that is why the CHIPINO, which was designed based on the Arduino footprint and experience gained from the Ultimate OEM, uses a PICkit 2 clone programmer instead of a bootloader. This also allows CHIPINO to run in debug mode. The Ultimate OEM had a debug mode as well and not the serial terminal window either. The Basic Atom software had debug capability built in so you could step through a program and run to a breakpoint. It also would show you register and variable contents. The Ultimate OEM in bootloader PIC module could debug with the Microcode Studio Plus software that would allow you to step through code and run to breakpoints. So even though Arduino is far more popular, it still doesn't have all the features this Ultimate OEM module had. Eventually the Ultimate OEM was stopped and put to rest. I still have a few modules and bare boards around. Another feature the Ultimate OEM module had was two built in LEDs, a momentary switch and a serial LCD connection. So without any other connections you could get some LED projects and switch projects running to test it out. Add a serial LCD and you were on your way. The module also had a 90 degree 0.100" header that plugged into a breadboard. Each pin of the PIC was brought out to that header so it was easy to expand the Ultimate OEM circuit. 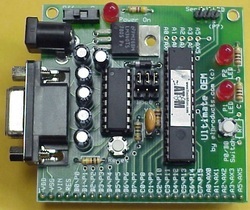 When you were done you could just unplug the Ultimate OEM and move it to a new breadboard leaving the old one in tact. Breadboards are cheap so it made it easy to keep projects around for a while. I also created a docking station for the Junun.org sumo-bot robot kit. This allowed you to plug all the servos and power from the robot into the docking station and then just plug in the Ultimate OEM for control. The docking station had separate power lines for the motor and Ultimate OEM so the motors wouldn't interfere with the Ultimate OEM power. It worked quite well. Below is the feature set of the Ultimate OEM as I had it advertised on my website. I also used this module in my book "Programming the Basic Atom Microcontroller" even though I didn't put it on the cover (kind of dumb now that I think of it). I know several people who still have Ultimate OEMs running projects they had built.